Chris from Celebrations at Home is my friend IRL and when I found her blog, I was blown away by her super creative and budget friendly party ideas. We’ve know each other since 6th grade and were even college roomates for a time. What happens at ECU stays at ECU…nuff said. We ironically stumbled onto each other’s blog. She creates these amazing inspiration boards to help you get ideas of what your party could look like…among other detailed party ideas she shares on her blog! So, I asked her if she’d do a Cinco de Mayo inspiration board for me and share a post about it. She happily agreed! Thanks Chris! 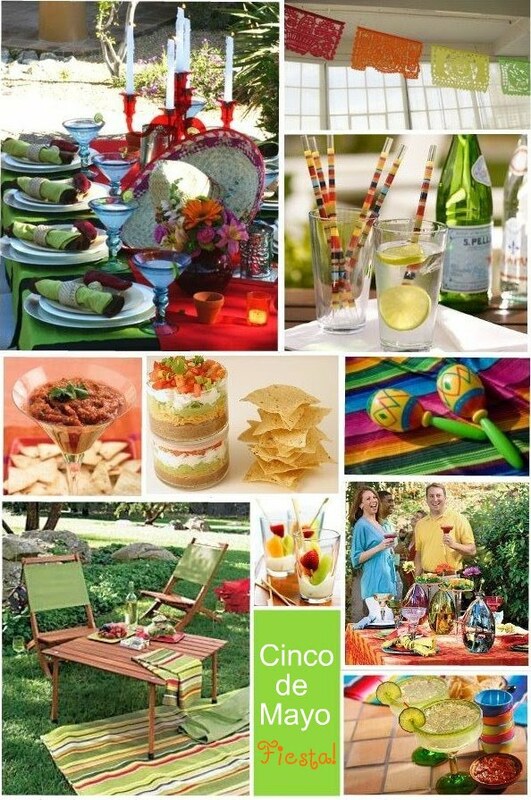 Celebrate Cinco de Mayo with a stylish and fun fiesta! Bright colors are the way to set the tone and of course some traditional Mexican details add pizazz! Gather together some friends for margaritas and heavy hors d’oeuvres. Make it easy by purchasing take-out from your favorite Mexican restaurant, or grocery store selections. Spend your extra time on presentation. Fun items like sombreros, serapes, and maracas can be found at many party stores this time of year. Serapes can be draped over the tables. Sombreros can hold tortilla chips, and maracas would make a fun napkin ring addition (just tie a colorful ribbon around the napkin and tie on a maraca). Hang colorful tissue poms, or printable banners from Paper and Cake. Tissue ‘flowers’ are also a traditional decor item you can place around the party space, in vases, or tie on to the backs of chairs. Take the party outside and set up multiple tables and blankets in the grass for a relaxed atmosphere. Now all you have to do is sit back and enjoy your guests. Ole! Hi, Kristi! Chris did a wonderful job on the board! I love all of the bright, festive colors. I'll be doing a Cinco de Mayo tablescape tomorrow. Come by and check it out!